The 2012 CAN AM RENEGADE for sale is a RENEGADE 1000 THAT COMES WITH A 6" CATVOS CUSTOM POWDER COATED LIFT, FRONT AND REAR GORILLA EXTREME DUTY AXLES, TRIANGLE ATV SNORKLE KIT INSTALLED BY TRIANGLE, EPI MUDDER CLUTCH KIT WITH EPI MUDDER BELT, 31" OUTLAW SKINNY TIRES THAT STILL HAVE LITTLE NUBS ON THEM, 14' CUSTOM BLACKED OUT ATV WHEELS, MILLION LED ATV GLOW LIGHTS WITH REMOTE CONTROL OFFERING 100 OPTIONS IN COLOR, K&N AIR FILTER. THE CAN AM is is PERFECT used CONDITION with just 67 HOURS AND 370 MILES ON IT CURRENTLY. THIS CLEAN, NICELY CUSTOMIZED ATV IS AN UNREAL MACHINE RUNS AND DRIVES LIKE NEW ABSOLUTLEY NO ISSUES EVERYTHING WORKS PERFECTLY. If you have any questions regarding the used CanAM Renegade for sale in this as or if you would like to make an appointment to see it in person or make payment and pick up you can do so using the space below that has been provided by GoGoCycles Used CanAm Motorcycle Classifieds and PLEASE do not forget to send me your contact information in your email or to provide a phone number or email address so that I can respond with answers to your questions or set up an appointment as quickly as possible. 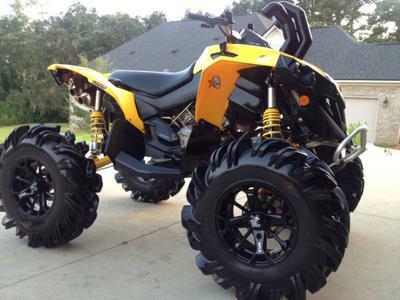 In my opinion there is not a better deal on a used ATV for sale as this custom Renegade 1000 on Craigslist or on Ebay. GoGoCycles invites our visitors to write a review of the 2012 CAN AM RENEGADE for Sale or share any thoughts and/or opinions to make potential buyers aware of any problems that are commonly associated with this quad or to highlight its positive features and help our visitors make informed decisions. The price I have on it is very good price and it probably will be gone FAST so email before it's gone and don't forget to mention that you found this ad on GoGoCycle's Motorcycle Classifieds www.gogocycles.com using the comments forms located on this page. Is this bike still for sale and how much. Has the motor been taken apart? Already pricing next year's models and have accessory pricing with financing. What is the price and where is it located?